Greg as seen on his character card. Greg is, during the events of the Perpetual Testing Initiative, the assistant of Aperture CEO Cave Johnson. Originally, he was written to appear during Portal 2's single-player campaign, however, he was replaced by Caroline prior to release and was considered to be cut from the game before being added back as Caroline's replacement in the Perpetual Testing Initiative DLC. According to the The Final Hours of Portal 2, one of the reasons Greg was cut was to eliminate the cost of hiring a new voice actor that only played a small role, instead of reusing Ellen McLain to voice Caroline. Doing this also provided a background for GLaDOS, due to the usage of same voice actors. In the universe of the Perpetual Testing Initiative, Greg's words are not entirely audible and comes off through the speakers as muffled. 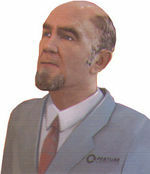 Greg's model from his character card is modified from Dr Magnusson's. In a line cut from Portal 2, Cave Johnson reveals that Greg had fought a bear in the past. According to a line of dialog said by Cave Johnson, Greg was responsible for the development of the multiple universe theory that lead to the Perpetual Testing Initiative project. In another piece of dialog from an one of the universes, Greg was "right" about the dangers of the genetic lifeform disk operating system initiative. Greg's character card from the Portal board game.